Microsoft Dynamics CRM, like most other CRM systems is comprised of three core modules: Sales Force Automation (SFA), marketing, and Customer Support (CS). In addition, there are some common components that span the modules. We’ll focus our functional review on these four areas. From its earliest version Microsoft Dynamics CRM has been a strong account and contact management solution. As a natural extension of Outlook, MS CRM allows the user to turn Outlook contacts into leads and accounts, convert these into opportunities and ultimately turn them into orders and invoices. With respect to contacts, leads and accounts, there are a large number of fields and tabs available for capturing key attributes. Through a new Relationships Editor, you can link each entity to another in a 1:1, 1:N and N:N configuration. Such as, an account can have many contacts and can be related to those contacts as employees of or owners of the account. A contact can also be related to multiple accounts, to one as a former employee and to another account as a current employee. You may also use self referencing relationships by relating an account to itself. I cannot provide an example of this, but the relational structure is available is you have a need for that type of connection. Opportunities in MS CRM, like other CRM systems, are essentially leads that have been promoted or qualified to advance to the next sales stage. Opportunities contain information fields relative to the prospect’s interest in a specific product or service, a specific price range, a specific timeframe and the probability of success or failure. All of these elements come together into a sales pipeline. Opportunities can be created from an account or a contact. You can also convert an opportunity into a quote and an order automatically, which is a great feature particularly for users of the Dynamics accounting products. There are many ways to input information about an opportunity, including menu items for selecting a price list and types of products. As you would expect, Microsoft CRM is tightly integrated with the Microsoft Office suite and includes the ability to do things like setup and use multiple email templates and merge to Outlook or Word. Also, exports to Excel are easily available. The Quotes and Orders functions in Microsoft CRM work hand in hand with a product catalog that supports kitting, substitute pricing and multiple price lists. These can be applied on Accounts and Opportunities. The application provides a straightforward flow to drafting and finalizing Quotes and turning them into Orders and Invoices. This is a great feature particularly for smaller companies that may want to do their ordering and invoicing directly in the system. Companies using Great Plains or one of the other Dynamics small business accounting solutions will have access to an integrated solution to push orders and invoices between systems. Larger companies that do not own one of the Dynamics ERP or Accounting solutions will have to integrate with another order management solution. At this time, there is no SaaS version of any of the Dynamics solutions available so a hosted option would not provide the back office integration that the on premise option does. 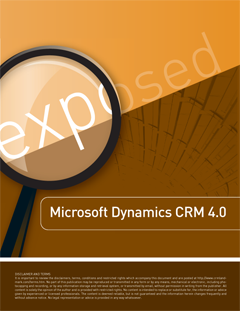 There are a number of new features in Microsoft CRM 4.0 that are heavily used by the sales organization. One is the ability to create transactions in different currencies and have them translated into a base currency. This feature coupled with the new language packs and the ability to segment your organization by Business Unit, Site and Team allows you to define and report results at each level. This kind of segmentation, combined with role based security, also allows you to segment visibility to Accounts and related entities (Contacts, Opportunities, etc.) by owner, business unit or other attributes. Another new feature in MS CRM 4.0 is the ability to turn an inbound email activity into an Account, a Contact or an Opportunity. This new version also offers the ability to have duplication rules defined at the Account and Contact level independently. This is a great feature if you want to search for duplicate Accounts by account name or website address or search for duplicate Contacts using email address. The downside to the duplicate checker is that it allows the user to bypass a duplicate warning, which then allows duplicate Accounts and Contacts to be created. Overall, I found the Sales module very strong. While I found the system to have a great deal of depth and breadth in collecting Sales related information, at times I found myself overwhelmed with the sheer number of menu items, tabs, options, popup windows, etc. that are available. The need for Microsoft to provide a Forms Assistant to help you fill out forms points to the fact that the forms are not intuitive and sometimes overwhelming. One of the biggest barriers to the adoption of any SFA solution, is the challenge for sales users to understand how the information relates and how any why it needs to be entered. On premise CRM solutions such as Siebel, SAP and Oracle have historically high implementation failure rates that can be attributed to the complexity to setup and use those systems. This is principally why simple SaaS solutions like SalesForce.com, which arguably occupies the lowest end of flexibility and complexity, were able to achieve such a high degree of success in user growth. The endless options in Microsoft CRM, even in a nicely presented package, requires a fair amount of “dumbing down” to be relevant and adopted by the average sales user. MS CRM can’t match the simplicity of some of the more established SaaS solutions that have been able to add functionality and improve adaptability over the years without harming the end user experience. Even with the large magnitude of setup and use options in Microsoft CRM, it is still lacking a few features that are ‘standard issue’ for a CRM suite. The most glaring deficiency is the lack of any type of sales process management built into the Opportunity forms. Most sales organizations follow a 5-7 step process during an Opportunity phase and will often have probabilities linked to those steps. While these functions can be added with some effort through customization tools and workflow rules, they are fundamental features that are included in the competitive products. Another feature missing from Microsoft CRM 4.0 is any method to score or evaluate Opportunities. While there are some rating fields, there’s no method to create a scorecard or a list of questions for managing a consistent way to qualify Leads or Opportunities. While not as common, especially among the newer hosted application competitors, Microsoft should have included it as a standard feature in version 4.0 given the depth of other aspects of this product. Another limitation in MS CRM 4.0 is the ability to do any level of detailed analysis when a sales opportunity was lost to a competitor. While 4.0 does provides a basic method to define competitors (strengths, weaknesses, etc.) linked to Opportunities, it lacks the ability to perform a win/loss analysis. While it can be difficult for sales users to collect competitor information, let alone entering it into the system, having this feature can be critical to understanding the difference between success and failure in the sales process. Finally, there is no Partner Relationship Management (PRM) functionality, which is a key offering in many of the more mature on premise and SaaS CRM solutions. While perhaps only relevant if you distribute products and/or services through third party channels, this is considered a fundamental extension to the core module.